The Fed plans to hold off quantitative easing unless economic expansion falters or prices rise at a rate slower than its 2 percent target, according to minutes of policy meeting. The dollar advanced against the euro for a third day today. Bullion and the greenback tend to move inversely. Gold also declined as jewelers in India extended a nationwide strike for a 19th day today to protest a tax on non-branded ornaments. 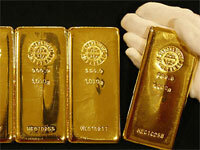 India was world's second-largest bullion consumer in the fourth quarter.